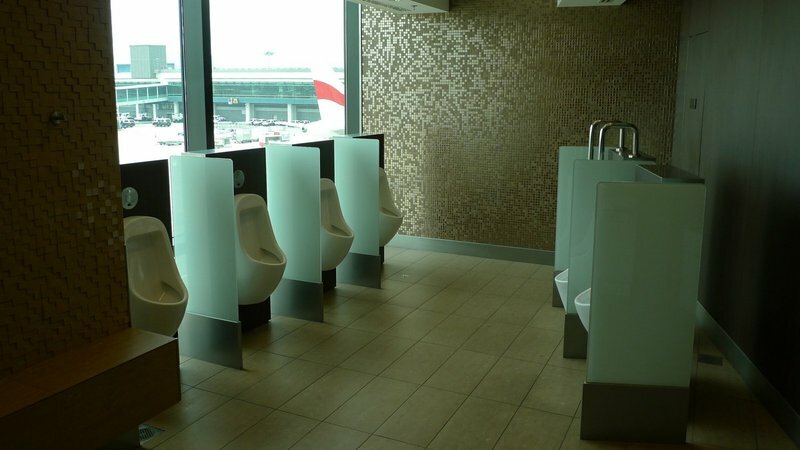 A toilet at Singapore Changi airport that offers urinal users an expansive view of the tarmac. One imagines that travels could end up standing there much longer than needed, fascinated watching the airplanes coming and going, resulting in long queues for the toilet. Much nicer than the usual airport toilet, no? This entry was posted in Uncategorized and tagged airport, changi, singapore, toilet by christao408. Bookmark the permalink. I could pee there all day. would the toilets more dirty as all looking at the view and forgot what they were doing? Much too elegant for the US! Very interesting concept though. I have been lucky enough to have been to the Changi airport. Very nice, and friendly airport! I’ve never encountered such nice customs officials! Wonder how many DON’T use the ones on the right. Or else, the lines are shorter for the ones on the right, especially if one needs to really go.. I think Changi is my favourite airport It’s got everything! Chris, if you like to take photos of special urinals, have you tried the one in higher level of Peninsula hotel? It is quite an experience. It was at the Singapore airport in ’92 that I first saw the sensor loaded wash basins. I was in the business class lounge and had a few hours of lay over before my next flight to Chennai India, so I thought I would take a shower. I was very impressed with the bathrooms and the shower area. I can see that. Such ideas you have. In the felix restaurant on top of Peninsular hotel they used the window glass as the urinal. So you stand there, look at the city light and people walking in the street below, and you just pee. Too bad they replaced these ‘urinals’ already.